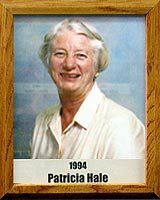 Patricia Hale has played and coached a wide variety of sports: softball, volleyball, basketball, archery, badminton, soccer, track & field, gymnastics, and field hockey. A Principal at Santa Rita High School, she is a past Principal of Exploratory Learning Junior High and Sabino Junior-Senior High School. She holds a Masters Degree from Ithaca College and a counseling Degree from the University of Arizona. She has officiated basketball and hockey at the University of Hawaii and at Cornell. Among her multitude of professional and community activities, Patricia has served on the AIA Girls Sports Advisory Committee and the Executive Boards of the Arizona Interscholastic and Athletic Associations. She was a 1992-93 representative to the AIA Southern Region 4A Conference, and is the 4A Conference President Elect (1993-94). She is also the first recipient of the TUSD Outstanding Principal Award (1992-93). A resident of Tucson, Patricia has been a dedicated Educator and Administrator, as well as a loyal supporter and friend to sports in Pima County.